Changes lead to a full-price sale! 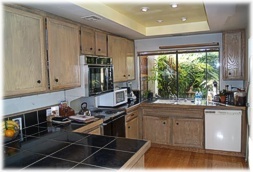 This Carlsbad property had been a rental home for 10 years and was very dated. It was in a prime location with one of the best views of the Aviara golf course I have ever seen. After being on the market for only a few weeks, the owners agreed to my enhancement/home staging program to add value to their property. The stucco and exterior trim was repaired as needed, it was painted with rich architectural colors and the landscaping was revamped. The interior was repainted in my famous custom paint color, wood blinds replaced the heavy padded valances and polished bronze fixtures and door hardware was installed. The brass hanging light fixtures were replaced with surface fixtures and can lights. 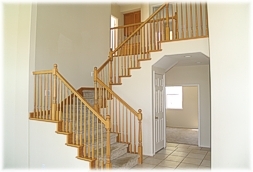 The biggest improvement was painting the old oak stairway system a crisp white. Within days of completing the work and uploading new photos in the MLS, we obtained three offers to purchase and it sold lightly over the $849,000 list price. Taking a executive home to a higher level! 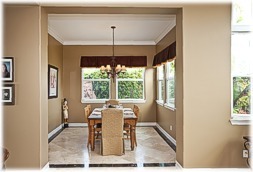 This beautiful Aviara executive home had a huge back yard and an upgraded interior. The plan was to make it more formal - less casual - to appeal to sophisticated buyers. The playset was old and in bad condition. It was demolished and the area seeded to expand the lawn. The interior color scheme was multi-toned and a bit dark. So, some walls and rooms were repainted including all the secondary bedrooms. A few window coverings were removed and quartz halogen bulbs were installed in those areas that were dark. 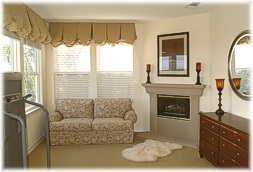 The home stager added and rearranged furniture as needed including in the master retreat and living/dining rooms. 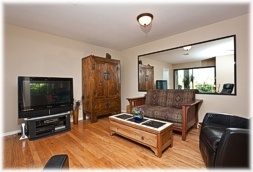 The retreat was de cluttered and furniture added to make it more inviting. The dining room had been used as a play/study area. 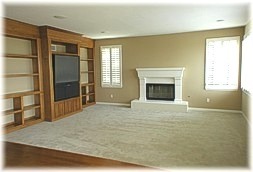 We changed the area rug to show more of the stunning wood floors and brought in a table. The home sold for $864,000 within a few days of a minor price adjustment. Creating sophistication and a sale in 31 days! Here are pictures of a staged home in Cristalla - a gated, ocean view community just a few steps from the Park Hyatt Aviara Resort. The owners were expecting a new baby and things were a bit disorganized. But, they were moving out-of-state and were totally open to home staging ideas. 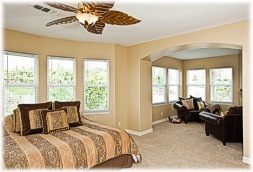 The light yellow walls were painted over with a rich custom Frazee paint color that appeals to every buyer. The home had an internal kitchen that was a bit dark. So, quartz-halogen bulbs were installed into the recessed lighting fixtures - what a difference that made. There was a pool table in the living room that had to go - it was sold to the painter for part of his services. 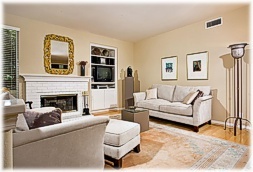 My staging consultant and I rearranged the furniture, stored some items and reduced the artwork on the walls. The results were spectacular - the third buyer to see the house paid $889,600 - cash! 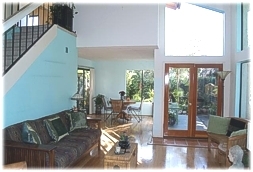 This Carlsbad residence had an open floor plan with high ceilings and lots of windows. However, it was still painted "builder white", had some dated accent wall colors and very few window coverings. The interior walls were painted with a rich paint color for home staging and the trim and doors were painted a crisp white. 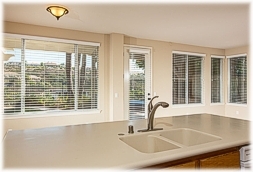 2-inch white wood blinds with detailed valances were installed. The owner was an artist with art everywhere! Half of her paintings were put in storage, the better ones re-hung, minor changes made in the furniture arrangement and the dining table was expanded and set for a formal meal. Window tinting was removed to allow natural light to stream in, quartz halogen bulbs were installed in the recessed light fixtures and obvious repairs were made. The home sold for $765,000 within 50 days of the enhancements being completed. Very little had been done to refresh this Encinitas home in 20 years. 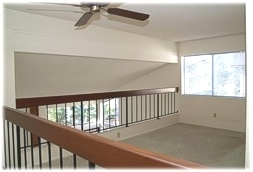 The interior fixtures were removed, popcorn ceilings scraped and miscellaneous repairs made. 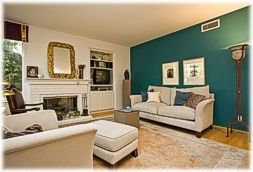 Then, the interior blue walls were painted with a popular home staging paint color. New carpeting was installed, the bathroom tile re-grouted and new bath and door hardware were installed. The old ivory electrical switches and receptacles were replaced with white Decora. The interior kitchen and family room were poorly lit, So, six new can lights with quartz-halogen bulbs and additional ceiling light fixtures were added to brighten things up. 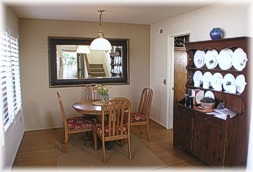 Office furniture in the dining room was replaced with a stylish dining table which was set for a formal meal. These staged home before and after pictures show the dramatic improvements that attracted a first time buyer in 43 days. 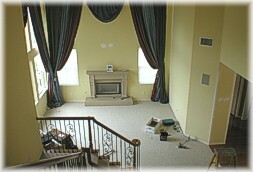 Wall color adds drama to Carlsbad executive home! 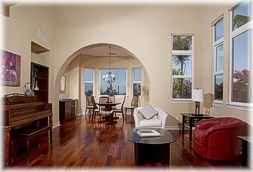 This beautiful Carlsbad home had a dramatic open floor plan with amazing views of the Aviara Golf Course. However, it had not been completely decorated and lacked drama. To transform the property to "Blue Ribbon" condition, the owners vacated the property and moved into their new home. 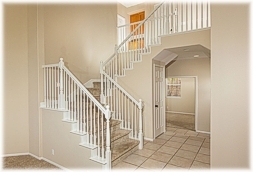 These home staging before and after photos show the power of home staging paint colors. 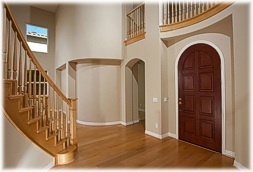 The entire interior was painted with a stunning Frazee custom decorator color. 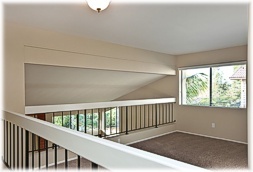 Minor repairs were performed, the windows cleaned, the carpeting was stretched and cleaned. The stamped concrete driveway was re-stained and sealed and the overgrown landscaping was trimmed to open up the view. 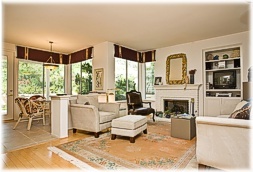 As these home staging pictures show, the results were fantastic - the home sold in 46 days for $1,090,000! 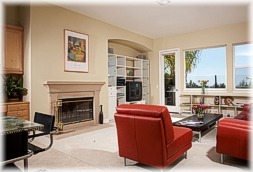 Aviara home transformed and sold in 19 days! 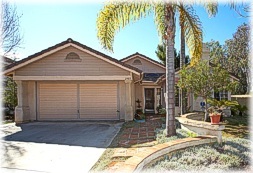 This Aviara home had been on the market with another agent for 224 days. During my initial inspection it was obvious why it had not sold! First, the cold white walls were painted with my favorite Frazee designer wall color. The home was only partially furnished. So, I emptied some rooms and fully furnished others. The artwork was re-hung in better locations and at proper heights. Old wilted house plants were thrown out, the windows and carpeting were professionally cleaned, my decorator added some accessories including a few new towels and a bed spread. The landscaping was pruned back to scale and new small plants and fresh bark mulch were installed. Tinting was removed from several windows to bring in more natural light and a few minor repairs were made. 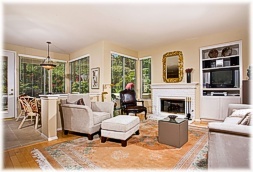 The total spent on home staging was only about $6,500 and the home sold quickly for $850,000. One happy and relieved owner! 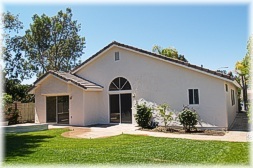 Dramatic exterior enhancement in Carlsbad! 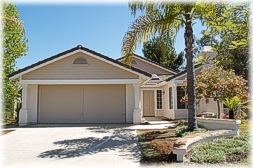 When the owner of this Carlsbad home moved into a senior community, her financial planner referred me to the family. 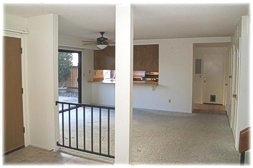 The home had not been maintained for many years as you can see by the exterior home staging before and after photos. Stucco repairs were made, the roof was tuned up and the termite and dry-rot repairs were made. Then, the house was painted inside and out and the yard and landscaping were enhanced. 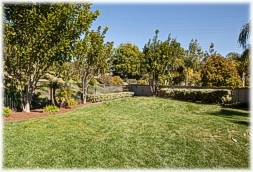 Many of the old plants were removed and the back lawn was increased in size. The cracked front sidewalk was demolished and a new curved walkway was installed. 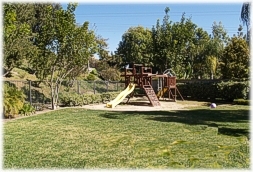 The irrigation system was repaired and the grounds became a friendly asset instead of a liability. 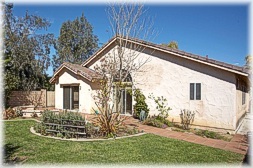 It went on the market for $629,000 and closed escrow at $600,000. 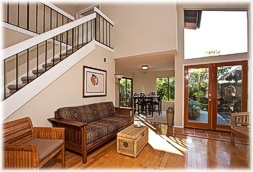 Encinitas home enhanced to sell for a top price! 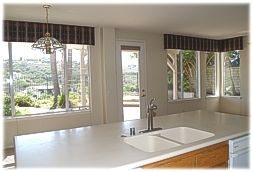 This Encinitas residence was almost in original condition. To make the transformation easy, the owners moved into their new home. 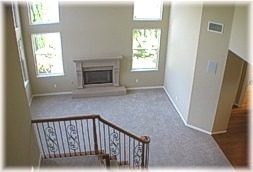 The popcorn ceilings were scraped, the interior was painted and new carpeting was installed. The bathroom tile was re-grouted and new bath and door hardware were installed. The ivory electrical switches and receptacles were replaced with white Decora. 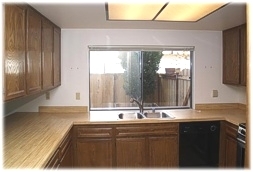 Cabinets between the kitchen and dining room were removed to open up the space. 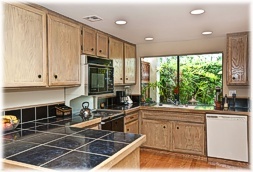 In the kitchen, six recessed lights with quartz-halogen bulbs replaced the old fluorescent light fixture and the 20-year old laminate countertops were replaced with ceramic tile. 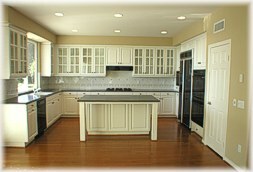 All the cabinets were touch-up stained and re-coated with a rich satin urethane finish. 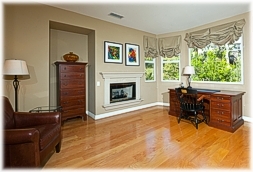 During the home staging process, I suggested a $10,000 increase in the list price. My hunch was right! The property sold prior to completion of the work for full price - $475,000. 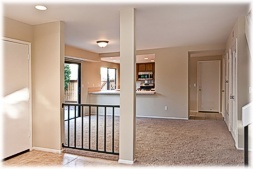 I estimate the $16,000 home staging budget increased the value by about $30,000. Making a great home even better!! 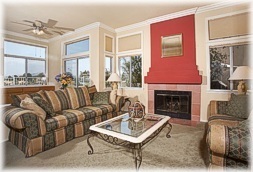 This Carlsbad home had been on the market twice before I finally got the listing. 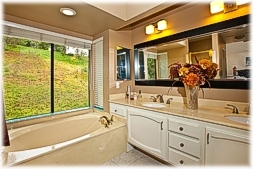 It was an amazing home with fine details and outstanding views. Very little enhancement was necessary and the enhancement budget was only about $2,000. 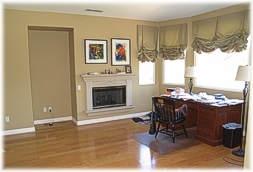 The dining room, office and master retreat were repainted a lighter color to open them up. A larger table was moved into the dining room and set for a formal meal. The carpeting was cleaned and several bad seams repaired. Some trees were removed to enhance the view, new plants were added and some sod was repaired. Missing window blind valances were replaced with new ones and a few stains on the stucco were fog coated with new color. The changes were dramatic. 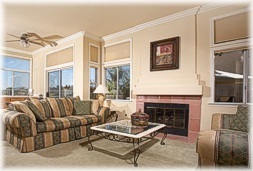 This stylish Rancho Bernardo residence was well decorated with nice furnishing and custom interior paint. It required only minor home staging to pull it all together. 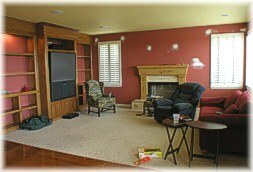 The home staging pictures show how much the red fireplace was out of place. So, it was painted to match the existing wall color. The plain-white secondary bedrooms were painted with home staging paint colors to match the rich wall color of the rest of the house. The walls and woodwork throughout the house were touch-up painted to perfection. Select pieces of furniture were rearranged to create a better flow and some art work was removed or lowered in height to be more in scale with the rooms. The irrigation system was repaired, the lawn over-seeded and new plants were installed in the planter beds. 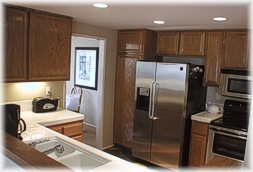 The repairs and home staging took about 10 days to complete. 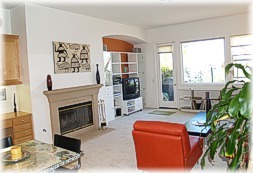 Home staging sold this Encinitas residence in 60 days! The owners of this Encinitas twinhome called me after their previous listing agreement expired. They agreed to a comprehensive enhancement program with a $6,800 budget. New baseboards were installed, old built-in speakers, hand-made shelves and two clunky ceiling fans were removed. 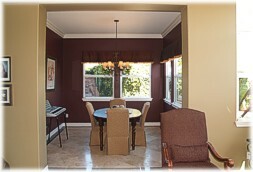 Sheet rock repairs were performed and the interior was painted a designer wall color with crisp white trim. 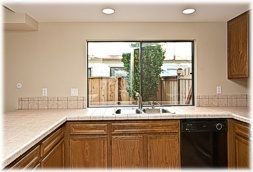 The lighting fixtures, door hardware and bath fixtures including the mirrors and medicine cabinets were replaced. New white Decora electrical switches and receptacles were installed. The florescent fixtures in the kitchen and the hanging light fixtures throughout the house were replaced with recessed lights with quartz-halogen bulbs. Under-counter lighting was added in the kitchen and framed mirrors replaced the large wall-to-wall mirrors in the bathrooms. 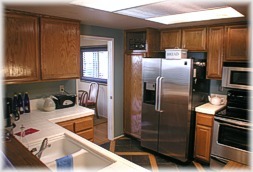 The wood cabinets were cleaned and refreshed. 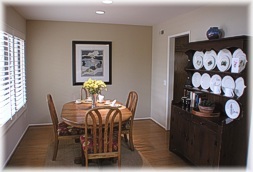 Notice how the dining room opened up and the new modern look of the kitchen. The sales price was $570,000. 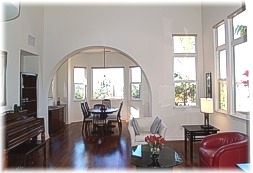 Aviara executive home required major home enhancement! 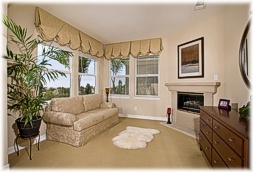 This Aviara home was a big home staging success story. The sellers vacated the property and told me to do whatever needed to be done to sell it. The home was over-decorated with dark paint colors, heavy drapes, gaudy wallpaper and dark window tinting. 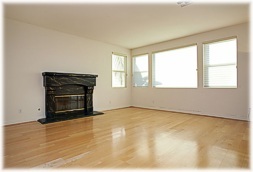 The wood floors were damaged and the berber carpeting was dirty and badly worn. Property enhancement included wallpaper removal, new interior paint, new carpeting, refinishing the wood floors, tint removal and general repairs. We also cleaned up the yard, added many new beautiful flowering plants and took down the child safety fence to show off the spectacular pool with ocean view. 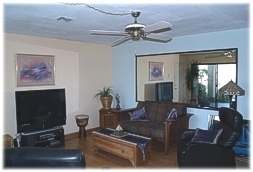 The home enhancement was completed in just three weeks and the changes were dramatic. Staged homes really do work and this one sold during the final home staging process for a record high price of $1,375,000. 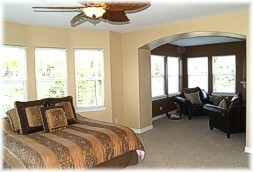 Encinitas master bedroom suite updated with paint. The time had come for this busy family to move up to a larger home and we wanted to enhance their old home for sale in the most cost effective way. Paint always offers the most impact for the money since it covers such a large surface in a home. The old maroon feature wall in the master bedroom was outdated. So, we brought in two companion colors that were separated by the existing chair rail . . . and it worked. 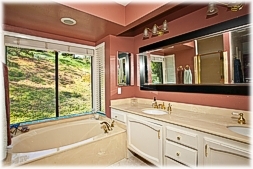 The pink walls in the master bath were painted the darker of the colors and new light fixtures and mirror were installed. These changes transformed the spaces to become warmer and more stylish. 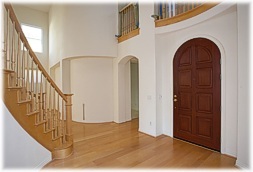 Want to stage your home for sale but you don't live in San Diego? If you're selling your home and want to find a real estate agent in your area who can offer you the advantages of home staging, call Neal Hribar or check the box below for a referral. He knows how to find a home staging Realtor® in your area who will help you sell your home for more money. There's no charge for this service. 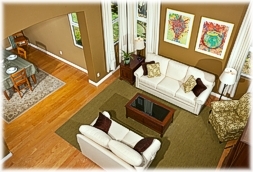 Would you like to learn more about home staging? 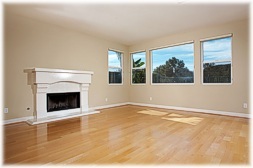 Neal has prepared a free home enhancement package to help you stage your home for sale. This package includes articles he has written on home staging plus reprints from various magazines and professional journals. 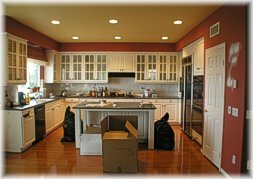 This free package covers every detail on home staging including: how to create a great first impression, how to gain a real advantage in selling your home, what you must do to enhance the exterior, how staging results in a faster sale and richer price, more "before" and "after" photos, packaging the interior and a section on extra details. To get this free home staging package, complete the form below and you'll receive it in a few days. Yes - please send me the free Berkshire Hatheway HomeServices, California Properties Home Enhancement Package! I'm going to use the Enhancement Guide to stage my home to sell. 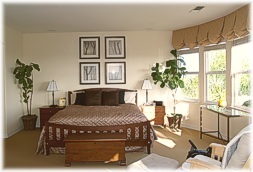 Please help me find a home staging Realtor® in my area. Are you relocating to San Diego? Click here for tips on how to be a more successful home seller.